This is Manet's last great masterpiece, painted at a time when he was already ill and finished a year before his death. It depicts a scene at the highly fashionable cafe-concert, the Folies-Bergere. Cafes-concerts flourished at this time and were places where one could drink and s ocialize as well as see circus acts, operettas and the like on the stage. Manet made a number of sketches at the Folies-Bergere, but actually painted this work in his studio. The central female figure was modelled by a girl called Suzon, who worked at the Folies-Bergere, while the man on the right was posed by the painter Gaston Latouche. Other figures in the reflected balcony are also identifiable. As was immediately noticed by the critics at the Salon of 1882 the depiction of the reflections in the mirror that runs the entire length of the background, parallel to the counter, are incorrect in naturalistic terms. The girl's reflection is shifted too far to the right, while the reflected image of the man is such that he ought to be seen in the foteground, somewhere between the viewer and the bar maid. The bottles reflected to the barmaid's left should be on the near, rather than the far, side of the mirror-image counter. Comparison with an oil study (Amsterdam, Stedelijk) shows that Manet deliberately changed his original composition in order to achieve this effect. He also altered the figure of the bar maid such that she appears in a more frontal and direct manner. Many of those who attended the Salons, would have thought barmaids to be of dubious character, offering themselves, as well as drinks, to prospective clients, and this caused the familiar criticism that the work depicted something unseemly. In fact, however, the expression of the barmaid is melancholy and indifferent, rather than enticing, though by contrast, her reflected image leans forward in a more forthcoming way. The subdued emotion that she communicates may suggest the deadening effect of commercialism, in which human affection is a commodity like any other. 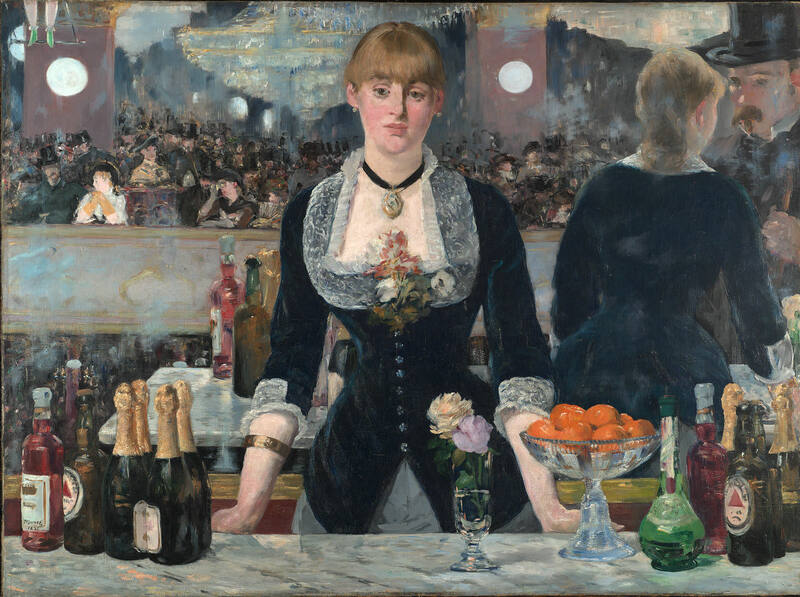 It has often been suggested that by the distorted optics of the work Manet meant to imply that the viewer was the original of the man reflected: the responsiveness of the barmaid in reflection may thus have been intended as an enactment of male desire. The way Manet painted Suzon, more solid and modelled than the other figures, makes her dominate the work. The reflected figute of the man she serves is much sketchier, while those in the balconies behind are very loosely brushed and lacking in individual features. So as to maintain this focus, the activity in the rest of the composition is deliberately marginalized: for example, at the top left we see only the cut-off lower half of a trapeze artist. The only other element of the wotk that attracts the eye so quickly is the still-life on the counter, one of Manet's finest, with its richly painted arrangement of bottles, fruit and flowers. This equivalence of treatment highlights the ambiguity as to what the barmaid offers for sale.